From stoves and fryers to candlelit tables and heat lamps, there are many ways employees and customers alike can burn themselves in a restaurant. Restaurant employees work with all kinds of warm/hot equipment, so it is no surprise that they may pick up minor burns throughout their employment. 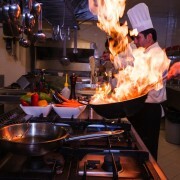 Burn injuries can be prevented and as the owner, it is your job make sure that your restaurant is a safe place to conduct business. Third Degree Burns: Destroys entire depth of the skin and can also damage fat, muscle, organs, and even bone. This type of burn is so severe that significant scarring is common and death can occur in the worst cases. Cook at manufacturers recommended temperatures so that you don’t overheat the oil. Lids should be tight fitting and handles should be securely attached to hot pots/pans/etc.